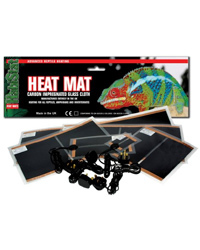 Habistat heat mats produce ultra long wavelength infra red heat. This wavelength is invisible to the human eye and tends to furnishings in the cage rather than the air. This action of heating is very similar to the sun and it has the ability to heat anything that it strikes but with the air temperature remaining much lower. Reptiles absorb this at in a manner very similar to basking in a natural enviroment. Heat mats do get warm but provide a very gentle warmth which the animal can sit under or on top of. Used under normal conditions the mats cannot burn the animal. The mat did not fit in my vivarium and I had to buy extra equipment and change my substrate to be able to use it as I was told it would be too hot.